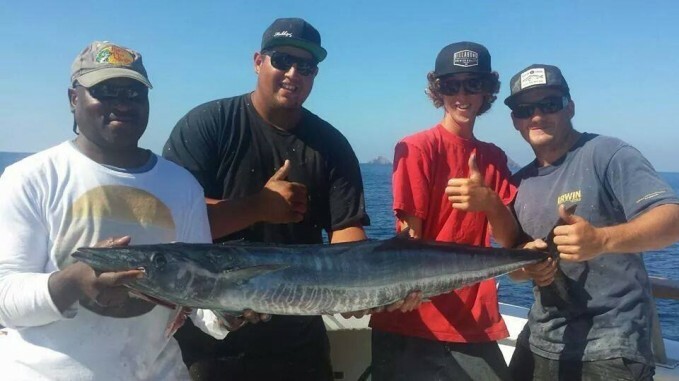 Wahoo on the local 3/4 Day Boat and Shortbill Spearfish off a 1.5 Day out of San Diego! Once again, Mikey does it captaining the 3/4 day boat, The Malihini. More to come later, but his 3/4 dat trip out of H&M Landing just landed a nice Wahoo locally. We just had a 50lb class wahoo lost to sea lions at the Coronado Islands yesterday and now this! What a crazy year this has been for exotics! The tuna have slowed down and this catch almost made me take all the hoop nets off my boat just now, but I guess I’ll just wait and see what tomorrow brings! *Update as of 10/23, the 1.5 day boat “Blue Horizon” got a Shortbill Spearfish on day one of a day and a half trip. The yellowfin tuna are also starting to make another push up the coast as more and more one day boats are picking them up. It looks like the season is not over, but rather making a hard push for a second wave of fish! Don’t pack your boat away just yet!